3. You can optionally use CSS to change the appearance of the containing element, such as height, width, border, margins, etc. If you're working with dynamic HTML, such as a single-page web app, you may need to insert PDFs on-the-fly. However, PDF embedding is not supported by certain browsers. If you insert markup without first checking for PDF support, you could wind up with missing content or a broken UI. The PDFObject utility helps you avoid these situations by detecting support for PDF embedding in the browser; if embedding is supported, the PDF is embedded. If embedding is NOT supported by the browser, the PDF will NOT be embedded. By default, PDFObject inserts a fallback link to the PDF when the browser does not support inline PDFs. This ensures your users always have access to your PDF, and is designed to help you write less code. The fallback link can be customized, or the option can be disabled if you prefer. PDFObject is npm-ready. Modern web apps use npm to manage packages and dependencies. PDFObject 2.x is registered with Node Package Manager (npm) and can be loaded dynamically. PDFObject also makes it easy to specify Adobe's proprietary "PDF Open Parameters". Be warned these parameters are only supported by Adobe Reader, most PDF readers will ignore the parameters, including the built-in PDF readers in Chrome, Edge, Internet Explorer, and Safari. Read more below. PDFObject is not a rendering engine. PDFObject just writes an <embed> element to the page, and relies on the browser or browser plugins to render the PDF. If the browser does not support embedded PDFs, PDFObject is not capable of forcing the browser to render the PDF. If you need to force browsers to display a PDF, we suggest using Mozilla's PDF.js. Note that PDF.js is subject to its own limitations, such as cross-domain security restrictions. PDFObject and PDF.js play well together, there are links to some great PDF.js examples in the Examples section below. PDFObject does not provide the ability to customize the look and feel of the PDF toolbar. The toolbar is controlled by the browser, and will vary widely from browser to browser (Chrome versus Safari versus Firefox, etc.). Some of these browsers provide the ability to show or hide the toolbar, or a feature such as the search field, via PDF Open Parmeters. However, in general the browsers do NOT provide any mechanism for customizing the toolbar. If you really need to customize the toolbar, try forking Mozilla's PDF.js and customizing it to suit your needs. PDFObject does not magically implement PDF Open Parameters. As mentioned above, these parameters are not widely supported. The PDF rendering engine either supports them or doesn't — PDFObject cannot force the rendering engine to implement these features. PDFObject 2.x is designed for modern browsers, and has been successfully tested in Chrome, Firefox, Safari (macOS and iOS), IE 9-11, and MS Edge. If you find issues or would like to share your own testing results, please post an issue in GitHub. IMPORTANT: Browser support for PDFObject does not mean the browser supports PDF embedding! PDFObject only embeds PDFs in browsers that support PDF embedding. Some browsers do not natively support PDF embedding, including Safari for iOS and Internet Explorer [chart]. For browsers that do not support PDF embedding, PDFObject provides a way for you to display alternate content. See below for details. 2.1.1, October 2018: Changed handling of iOS to reflect Safari's lack of support for embedding inline PDFs. (In iOS, Safari will only display an image preview of the first page of a PDF, and will not render other pages of the PDF.) Other iOS web browsers use Apple's native WebView to render pages, which leads to the same limitations as Safari. Therefore, PDFObject now assumes any iOS-based web browsers will not support PDF embedding. 2.1, October 2018: Changed assumptionMode default from false to true. This will ensure PDFObject 2.x will work for Firefox users without requiring them to change their codebase to enable assumptionMode. All they need to do is load the latest version of PDFObject, the PDFObject utility will take care of the rest. 2.1 (dev branch), January 2017: Modified to support Mozilla's removal of navigator.mimeTypes inspection. Added assumptionMode for manual override of PDFObject's default navigator.mimeTypes sniffing. 2.0, April 2016: Initial release of PDFObject 2.0. Contains breaking changes, and is not compatible with PDFObject 1.x. PDFObject provides two properties and one method. Returns true or false based on detection of navigator.mimeTypes['application/pdf'] and/or ActiveX AcroPDF.PDF or PDF.PdfCtrl. PDFObject does not perform detection for specific vendors (Adobe Reader, FoxIt, PDF.js, etc.). Note: For those who wish to target PDF.js, there is an option in PDFObject.embed() to force use of PDF.js. Read below for more details. Returns the version of PDFObject. Returns the embedded element (<embed> for most situations, and <iframe> when integrated with PDF.js), or false if unable to embed. The heart of PDFObject, the embed method provides a ton of functionality and flexibility. See Examples for specific code examples and functioning demos. The target parameter can accept a CSS selector, HTML node, or jQuery object. The options parameter provides a lot of flexibility. Alias for PDF Open Parameters "page" option. Any number entered here will cause the PDF be opened to the specified page number (if the browser supports it). If left unspecified, the PDF will open on page 1. Any string entered here will be appended to the generated <embed> element as the ID. If left unspecified, no ID will be appended. Will insert the width as an inline style via the style attribute on the <embed> element. If left unspecified, PDFObject will default to 100%. Is standard CSS, supports all units, including px, %, em, and rem. Tip: It's safer to specify dimensions using CSS. See "Specifying dimensions" below. Will insert the height as an inline style via the style attribute on the target element. If left unspecified, PDFObject will default to 100%. Is standard CSS, supports all units, including px, %, em, and rem. fallbackLink [string] or [boolean]. Default: "<p>This browser does not support inline PDFs. Please download the PDF to view it: <a href='[url]'>Download PDF</a></p>"
Any string entered here will be inserted into the target element when the browser doesn't support inline PDFs. Use the shortcode [url] to insert the URL of the PDF (as specified via the URL parameter in the embed() method). fallbackLink: "<p>This is a <a href='[url]'>fallback link</a></p>"
Allows you to specify Adobe's PDF Open Parameters. Warning: These are proprietary and not well supported outside of Adobe products. Most PDF readers support the page parameter, but not much else. PDF.js supports page, zoom, nameddest, and pagemode. page is the most widely-supported PDF Open Parameter outside of Adobe products. Note that PDFObject provides a convenient alias for page so you don't need to use the pdfOpenParams child object. All other PDF Open Parameters need to be listed as children of the pdfOpenParams object, as illustrated above. If you would like to use PDF.js with PDFObject, you will need to specify the URL of the PDF.js viewer HTML file. PDFObject will automatically append the required querystring to the PDF.js viewer HTML file URL. See the Examples section below for a functioning demo. If this boolean is set to true and the PDFJS_URL string is not null, PDFObject will attempt to use PDF.js to embed the PDF in the browser, regardless of the browser's default PDF viewer. Older browsers require third-party plugins such as Adobe Reader for displaying PDFs. Most newer 'modern' browsers provide PDF support natively, and no longer require plugins. When PDFObject's assumptionMode is set to true, PDFObject will check to see if the browser is considered modern. If yes, PDFObject will assume PDF support is available, will bypass its normal PDF support detection, and will write the PDF embed code to the page. Browsers that are not considered modern will fall back to the default PDFObject behavior — a check will be performed to see if PDF embedding is supported before attempting to insert the PDF embed code. 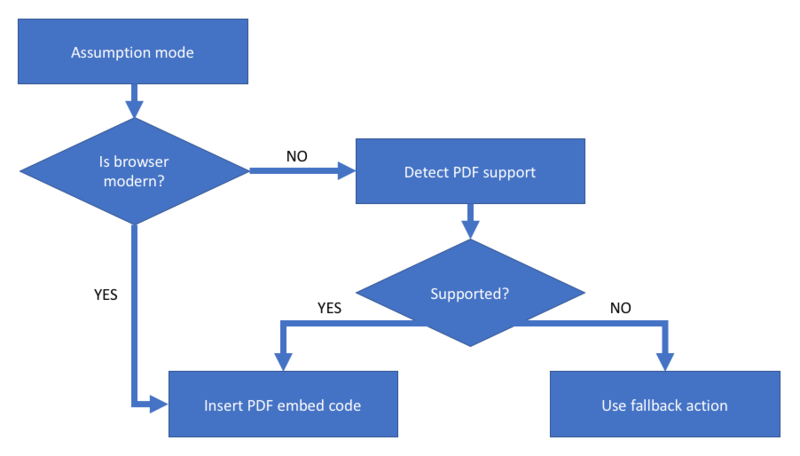 If PDF support is detected, the embed will proceed. If not, the normal fallback behavior will apply. assumptionMode is a direct response to Mozilla's decision to remove navigator.mimeTypes support in Firefox. Mozilla is attempting to make Firefox more secure by reducing opportunities for browser fingerprinting. Plugin inspection is a core component of many browser fingerprinting techniques. However, many well-intentioned scripts such as PDFObject query navigator.mimeTypes to determine whether specific media, such as PDFs (navigator.mimeTypes['application/pdf']), Flash SWFs, and specific audio or video codecs are supported. Here are some of the most common use cases for PDFObject. See the Examples section below for more examples. If you don't specify a target element, PDFObject will default to document.body, which will cause the PDF to fill the entire browser window. The following two examples have identical functionality. By default, PDFObject generates an <embed> element with a width and height of 100%. It will automatically fill the target container. PDFObject allows you to specify dimensions via the options parameter. These dimensions will be appended directly to the <embed> element, as shown here. If you specify dimensions on the <embed> element directly, you will lose the ability to resize the element via CSS, because the inline styles will always take precedence over the other styles in your file. Therefore it is recommended that you specify dimensions using external CSS rules, as shown here. Note: PDFObject automatically appends the class pdfobject to the <embed> element, and pdfobject-container to the target element. This helps you target your element in CSS. In this example, the dimensions of the target element are only specified if the PDF has been embedded (via the pdfobject-container class). As previously mentioned, most PDF Open Parameters are not widely supported. However, there is one parameter that enjoys wide support: the page parameter. If you specify a page number using the page parameter, as shown in this example, the PDF will auto-scroll to the specified page number. The following links demonstrate the many ways PDFObject can be utilized.